As the photos of past winners flashed on screens flanking the podium, Brecke said it was an honor to be among them. 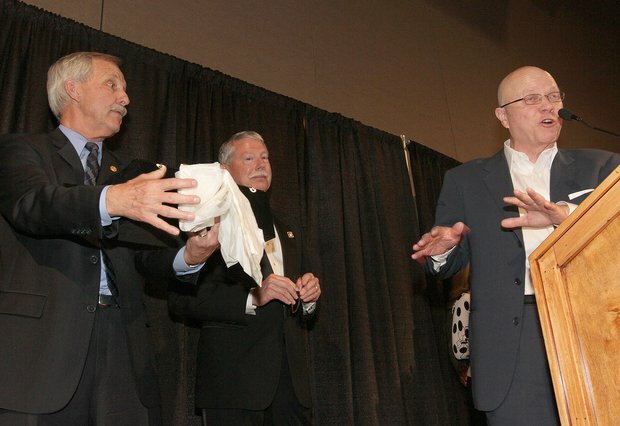 Brecke, who was surprised with the honor at a banquet at the Three Rivers Convention Center in Kennewick, has provided leadership — and often generous donations — to support the Hanford Reach Interpretive Center, Kennewick General Hospital, Red Cross and United Way, among other organizations. His white BMW convertible was raffled to provide the seed money to help start Domestic Violence Services of Benton-Franklin Counties and he also provided office staff time and equipment. He’s been a supporter since, according to his nomination by Mary and Coke Roth. At his recent 60th birthday party, Brecke raised money for the Red Cross of Benton Franklin County and the Tri-Cities Food Bank, one of many fundraisers he has held at his home. He has been co-chairman of the Capital Campaign Steering Committee for the Hanford Reach Interpretive Center for more than four years, helping make the recent decision to downsize and revamp the design, which has allowed the project to move forward. He’s pledged $50,000 of his own money to the project, and has been instrumental in getting the Columbia Center Rotary to pledge $300,000 to the center. He’s been a member of the Columbia Center Rotary since 1985, including serving as president and on the group’s charity board. In 2012, he worked behind the scenes with the governor’s office and Sen. Mike Hewitt’s office to keep the construction of a new Kennewick General Hospital in the Southridge area on schedule, preventing a costly slowdown, according to his nomination for Tri-Citian of the Year. He served on the hospital’s board for seven years and has helped the KGH Foundation Gala Devine by throwing dinner parties at his home and auctioning weeklong stays at his vacation home in Southern California. He’s also been generous with United Way of Benton-Franklin Counties. Since serving on its board from 1998 to 2003, he has been a member of its Alexis de Tocqueville Society, requiring a $10,000 donation. He’s used his contacts to recruit for the society and has played host to many of its events. Former Gov. Chris Gregoire, a Gonzaga University law school classmate, tried to get Brecke to apply for a seat on a state board or commission when she took office in 2005. She was successful in 2007, when she offered a position on the Community Economic Revitalization Board. Six years later, he continues to attend day-long meetings of the board in Olympia every other month as a volunteer. He also uses his time to conduct services two Sundays a month for the residents of Kennewick Life Care Center as a member of St. Paul’s Episcopal Church in Kennewick. He has brought Holy Communion to congregation members too sick to come to church for more than a quarter century. Brecke founded Allen Brecke Law Offices in 1983, and before that worked for two other law firms. Allen Brecke better be careful, or he’ll give lawyers a good name. He’s already made a lie out of the bum rap that has put lawyers at the receiving end of so many mean-spirited jokes. The Kennewick attorney was named Tri-Citian of the Year on Saturday night before a crowd of well-wishers at the Three Rivers Convention Center. His years of community service and financial contributions to worthy causes around the Mid-Columbia would elevate the reputation of any group he’s a part of, including the one he’s just joined — winners of the highest honor our community bestows on one of its own. It’s fair to say that the economic, spiritual and physical well-being of all Tri-Citians are much improved by Brecke’s donations of time and treasure. He literally is helping to change the face of the Tri-Cities — particularly at Southridge and the west end of Columbia Park, where major public construction projects are under way, thanks in part to Brecke. Brecke has been co-chairman of the Hanford Reach Interpretive Center’s capital campaign steering committee, helping secure the money needed to start construction. His efforts include using his influence as a longtime member of the Columbia Center Rotary Club to engineer a $300,000 pledge from the service group to the interpretive center. He’s pledged $50,000 of his own money to the Reach, but such generosity isn’t unusual for Brecke. Brecke donated his office staff and equipment to help set up Domestic Violence Services of Benton-Franklin Counties, then donated a BMW convertible to be raffled off for seed money to get the organization started. He regularly opens his home to fundraising events to benefit the Red Cross of Benton-Franklin County, United Way of Benton-Franklin Counties, the Kennewick General Hospital Foundation and other charities. Other charities that receive regular financial support from Brecke include the March of Dimes, Children’s Developmental Center, the Boys and Girls Clubs, Young Life, the Vista Youth Center, My Friend’s Place, Second Harvest Tri-Cities, Desert Sun Guild of Children’s Hospital, Tri-City Water Follies, Delta High School and Tri-Cities Prep. He has served on the Kennewick General Hospital board for seven years and worked behind the scenes with the governor’s office and Sen. Mike Hewitt to keep construction of KGH’s new Southridge hospital on schedule. Brecke is a lifelong member of St. Paul’s Episcopal Church, and for 25 years he has conducted services for residents of the Kennewick Life Care Center. He also regularly brings Holy Communion to homebound church members. He’s also a member of the Tri-Cities Visitors and Convention Bureau, Tri-City Regional Chamber of Commerce, Tri-City Development Council and the Columbia Basin Badger Club. So, how many lawyers does it take to change a community for the better? If you’re Allen Brecke, just one.